Peter Drew does NOT produce boring art. In fact, his art sparks conversation and, sometimes, controversy. 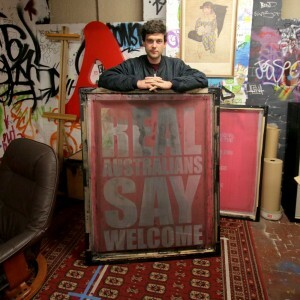 We find out more about the Real Australians Say Welcome artwork and upcoming projects throughout the show. We also get an urban art installation workshop from the man himself! In Time To Think, George Inglis reflects on the Undervaluing Of Arts and Creative Industry in Our Economy. In IS IT NEWS, Nigel comes up with a last minute quiz about street art in Adelaide (actually Andrew does). In the Made To Move Minute, Max Martin: What they aren’t telling you about cortisone, and how to get the best from it. But first, David Washington from In Daily presents his midweek news wrap, Talk Of The Town. More details and timecodes below. Looking for something in this episode? We have captured the time marker in the notes below to help you find selected content faster. David Washington, editor of In Daily, gives us a midweek wrap of the news we’ve been talking about in South Australia this week. Rymill Coonawarra 2009 Cabernet Sauvignon. Tasting notes. Max Martin and/or Dr Nathan Harten from iNform Health and Fitness Solutions, Norwood, present a thoughtful minute for pondering more ways and reasons to get moving and improve your health. This week: What they aren’t telling you about cortisone, and how to get the best from it. Peter Drew Adelaide Artist is an Adelaide-based artist who has been making art since 2006 and writing about art since 2009, however his name is very well known for his ‘uncommissioned art for the urban landscape’, such as one of his most recent art-led campaigns: a series of posters saying Real Australians Say Welcome. The news history quiz with Nigel Dobson-Keeffe. In our street art quiz this week, Nigel references his map of street art in Adelaide which is online. Nigel’s Urban Art Map 2015. And our song this week, Lovey Dovey by Maggie Rutjens, is one Adrian Miller, our musical curator recommends. 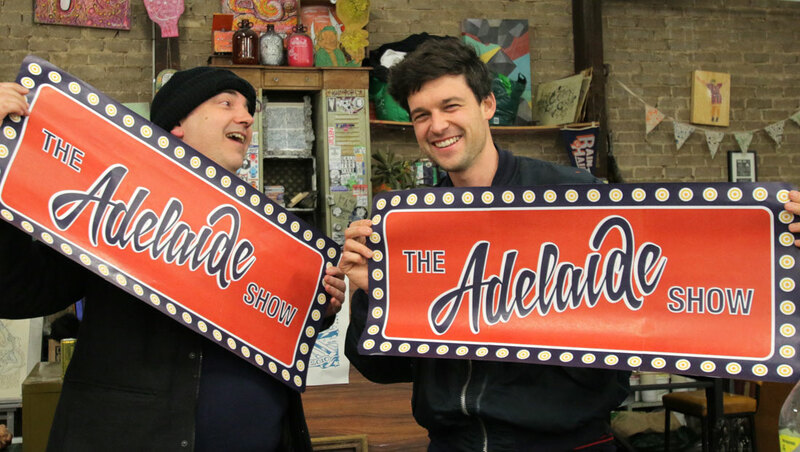 Adrian Miller can be heard on the Radio Adelaide Monday night program, Songcatcher. See Maggie’s video below. Can you buy your way to art status?